World renowned violinist Daniel Weltlinger's seminal Jewish-Jazz project exploring the complicated issue of individual human identity within the context of an intensely globalised yet fractured 21st century reality. Zohar's Nigun is a very deep musical concept to do with identity, the fact that whatever ethnic and national background you are from in our hugely globalised world today is what it is and that no-one has a right to hold a grudge against you for it or put a box around what your own identity is. 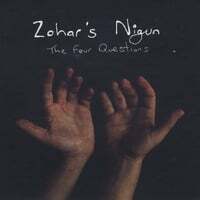 Q: You describe Zohar’s Nigun as exploring the complex concept of identity in the 21st century using the analogy of four musicians with Jewish heritage living in Australia. What prompted you to pursue this intriguing idea through the vehicle of music? A: My idea for Zohar's Nigun came about as a kind of backlash against cliched interpretations of what it 'is' to be Jewish - or of any nationality or culture for that matter. One's identity is of course an entirely individual thing and depends on so many varying factors such as family background/upbringing, country of birth, city/area of residence etc. The name of the band translates as a 'song from deep within' and the album title 'the four questions' is about the four musicians who make up the band and the question of what it means to belong to a Jewish heritage which in itself is an analogy for all people and their respective family and national backgrounds. The music of the band explores these feelings and concepts mixing very old (and not so old) traditional Jewish songs, contemporary Jazz and most importantly original compositions by the four band members. Q: The context within which you place these four musicians is of course Australia. How does the weight of the Indigenous heritage, overlain by the country’s contemporary increasingly diverse multiculturalism, impact on the traditional music of the Jewish diaspora? A: I think the Indigenous heritage we have all around us is a huge and generally often overlooked subject matter in our mainstream culture. It really doesn't matter which nationality, religion or culture you are from. Our very being in this country means that we are influenced even at the depths of our subconscious by the Australian Aboriginal peoples (who have been here longer than any recorded history..) and this impacts musically on all of us whether we like to admit it or not. It is a huge irony being born on a land that has had a continued Indigenous presence for thousands upon thousands of years while the religion I belong to - Judaism - has only been around for four and a half thousand years (hmmm let me see Christianity 2000 years or so, Islam 1400 years or so...) The traditional music of the Jewish diaspora (as with many people's traditional diaspora music throughout the ages) is naturally influenced by it's surroundings. That we live in a hugely multicultural country with an Indigenous heritage spanning some 50-60,000 years makes the music of the band - traditional and not so traditional - all the more richer, deep-meaning and beautiful. This first track is deliberately tense sounding and unresolved. This song was composed by Naomi Shemer after the 6 day war at a particularly nationalistic time in Israel's history and I played around with the harmonisation of the song by taking certain phrases and sections of the song and taking ages to resolve to the next chord. The track has a sad waltz feel - like being totally lost in the world -and this is symbolic of the endless strife in the middle east, being in the/a diaspora, the contested issue of Jerusalem, the importance of Jerusalem in Jewish tradition for thousands of years - basically many unresolved conflicting feelings. The fact of the matter is that even though many of us live in the secular world and are far removed from Israel and the continuing conflict all Jews are meant to face the direction of Jerusalem when they pray, Jerusalem is mentioned many many times in the Tanach and it is actually a centre piece of Jewish culture. We say 'Next Year in Jerusalem' every year at Passover which I always feel is such a strange phrase but we nethertheless traditionally say it. It is such a convoluted concept and it is so old and so fragile this concept of the Jewish home land, Jerusalem, etc and it is so sad the situation in the middle east and how much it seems to continue to spiral and how all Jews from way back pretty much all come from this land but are conflicted by varying feelings and opinions on the political situation and their own place in the whole story of the Jewish people. These are 2 songs that are according to a number of rabbinical sources from the time of the temple so are some 2500-3500 years old. The Kohanim song only gets recited a small number of times a year during holiday festivals such as Passover, Sukkot, Yom Kippur, Rosh Hashana etc but it has always struck me as one of the strangest sounding of prayers. The Kohanim get up, we all wrap our prayer shawls around ourselves to cover our eyes and they chant this strange melody that to my ears has always SOUNDED old. I played with the concept of communication within the band so the violin plays at being the Kohen and the rest of the band chimes in like the congregation of the synagogue. From this song Dan Pliner does an incredibly beautiful Bill Evans style introduction into the much older version of the popular song Aveinu Malkeinu which is a song for forgiveness. In this context, using the violin as an analogy of the personally I ask for forgiveness to the heavens above for my transgressions, for our people, for all people, for the damage being done to our world by greed and corruption, for the destruction of so much beauty in the name of human development and the destruction of the natural order.. In response to such dark feelings within the context of forgiveness Aveinu Malkeinu is followed by Hallel - songs of praise to the heavens above and a reflex of positivity and pure optimism in the face and of and despite of so much wrong doing in the world by mankind. The song is self explanatory and the two tunes within the Hallel medley are Odcha and Malecha Hayam which are old traditional songs that we spice up in a more Jazzy contemporary way and have a lot of fun with. If ever there was a traditional Jewish song that sums up so much what could be done to rectify inter communal strife it is this song. The notion to sit (not stand above but to be on the same eye level and sit which is a mark of humility) as brothers together (which is of course an analogy for all human beings) means we are all one. No one human being is better than the other, we are all the same. And how beautiful it is when we can sit together - yachad - not separate. This is for me a really deep concept and it hurts me very much because it is such a simple and kind concept that a lot of people don't cherish. The song goes through all the keys deliberately and this is a an analogy for all human beings being connected, for the stars begin aligned and connected, for music and harmony and sound and time and space being connected and for a simple yearning for mankind to realise that everything is connected and that we are all passing dust in space and time. This is a short half a minute 'scream' from the band, sounding almost like static gone crazy from a radio symbolising the passing of time through the ages and the transition from the previous traditional Jewish songs - Yerushalayim She Zahav to Kohanim/Aveunu Malkeinu to Hallel to Ma Nishtana to Hinei Ma Tov U Ma Naim - to a sequence of four original compositions by the respective four band members. This is my composition. I guess I am the guy with the craziest of backgrounds - French-Hungarian-Israeli having grown up hearing five languages spoken between my parents although was never taught these languages. The title translates as 'Much Love' and is based on the ancient Ahava Raba scale commonly found in European Jewish music. It is a waltz and is a delicate, fragile piece based on my own traditional leanings and the melodies of the synagogues that I have grown up with all my life. It is also a subtle tribute to my late father and the feelings he imbued in me of tolerance towards others and openness of heart. This is bassist Simon Milman's composition. Simon is a great bass player and was born in Argentina to Argentinian-Russian parents but grew up in Australia. Particularly importantly concerning the concept of Zohar's it is his Dad who is Jewish and Simon has really nothing at all to do with this aspect of his heritage - which is the whole point. Simon's understanding of having Jewish background is entirely different and separate to my understanding - or Daniel Pliner's or Alon Ilsar's - of having this heritage. Simon does have a connection to this heritage in his music perhaps, or his facial features or..something deep down, sub conscious, lurking around. Simon's composition is very lively, is in 7 and alludes to the time that Simon lived in Marrickville (which is where I live these days) and how many of the old Greek ladies from the neighbourhood used to mistake him for being Greek and speak to him in Greek hence the title which refers to a delicacy you can find in many of the great food shops around this area. This is pianist Dan Pliner's composition. Dan is one of my favourite musicians (and people) to play with, we have been playing together for 15 years and he has a very large part in putting together Zohar's Nigun. His family is South African born although Dan is born in Australia, and his parents in fact financed much of the recording after hearing us play some years ago. We have been writing music together for a very long time. Like me, Dan is from a traditional family and is a fatalistic, slightly kabbalistic character although he is not as religious leaning as me. This is a typically beautiful composition from Dan and even though the title was an afterthought it brilliantly captures this feeling of being a 'wanderer' - which you can look at as being the Jewish experience, the Australian experience, the musician experience, etc. Finally we have Alon Ilsar's composition which he has in typical round about Jewish fashion named originally after a different composer - A Moller. This composition comes from Alon's band 'The Colours' which was a tribute band to a band that never in fact existed.. (!!) Alon was born in Israel to a typical secular we don;t like religion very much Israeli family but grew up in Australia and his father is a lecturer in Kabbalistic numerology at Sydney University which might explain things a bit. This composition is a lively middle eastern sounding romp that descends into free jazz madness before ending in a joyful hora - is a lot of fun both to listen to and play and is a great ending to the little journey that is this CD. This is the little afterthought track and was for a long while on my mind to include. I recorded this track some time after the initial recordings of the band at 301. It is a field recording which took place at Echo Point in the Blue Mountains late in the evening shortly after a storm when there was no one around. There was a big thick fog around the 3 sisters and I sang to myself Shema which is one of the very oldest of Hebrew prayers. It translates as 'Hear O Israel, the Lord is everywhere, the Lord is one'. My point is not necessarily a religious one but rather a cultural and an ironic point. This prayer has been sung without a doubt through the ages by generations upon generations upon generations of the Jewish people to which all four band members's families belong to. It is a prayer with a subtle underlying cry for peace in the world and I deliberately recorded it in a place of religious significance to the Indigenous people for it is an irony being on this land that has been habited for so many thousands of years by these people. We are on their land - even if it not our fault - and this must always be acknowledged with respect, even if in the most subtle of ways. It seemed fitting to conclude the first Zohar's Nigun CD with one of the oldest of the Jewish people's prayers sung at a place of incalculable age that was habited by a people with an incalculable history. Jazz is a music that can blend in with just about any culture, any country or nation or any people’s traditional music – a truly democratic multilingual art form. ‘Zohar’s Nigun’ (literally a song from the depths of one’s soul) is about the reality that is one’s family origins no matter where in the world one is based. Using the analogy of four Jewish musicians living in multicultural Australia – a land populated some 40,000 years or more by Aboriginal people – the conceptual point of the band is that every human being has a family heritage that they belong to, and what’s more in our time of mass globalisation belong to in many cases outside of the country that they are living in. No one can choose where their parents are from or what their skin colour or ethnicity is – it is an impossibility. It simply is and is beautiful and meant to be. Devoid of the usual cultural clichés, four guys with Jewish heritage living in Australia present four very different understandings of an ancient yet ever metamorphosing culture and ethnic heritage. Utilising an at times sharp sense of humour and a deep understanding of history and its endless repercussions the band’s music offers an antidote to prejudice and stereotyping when so many voices lacking reason and balance seem to dominate the mainstream media. Shalom! night different from all other nights? Who are we? Who am I? One cannot choose who they are.